We are just two people who love to cook and love to eat. Their favorite sayings on the show is "Can't you smell what the Manns are cooking and Mann that's good. The concept of Hanging With The Manns is about going out doing wacky adventures and coming home and creating foods around the adventure. We travel everywhere like New Orleans, Florida, Texas Motor Speedway, Island of Nassau in the Bahamas, Atlanta Georgia, and Austin Ranch. We also go bull riding, and goat dressing. Being married for 25 years, we have some really, really fun stories. David says, Tamela made this meatloaf the first year they got married and it was nasty. She also had this little car she ran over him with twice. Some may say we share a little too much with you, David states, but Tamela loves to kiss and why in the world do I feel her tongue in my mouth (David laughs why Tamela denies it). We don't always agree on this show, but Tamela Mann says David is chicken in some of the adventures they do together. Ultimately, our show is about food and love. The hardest thing about this show is trying to keep David serious, Tamela says. But David says he just loves having a good time! Of course you can't have a cooking show without great food and no we are not chefs, but we just like to try different things and to let you know how easy it can be. If we can do it, than you can do it. You wanna hang, I wanna hang, we all want to hang with the Manns. 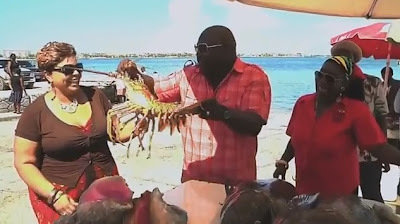 The couple was seen on the 700 club preparing a Cajun Shrimp Po-Boy Sandwich. It's hilarious that the lady who was in the kitchen with them didn't know how to say "Po-Boy." I guess with me living in the south and Tamela and David Mann being from Texas, we are just country...lol! Cajun Seasoning (minimum of 4 teaspoons) but season your food to your liking. A long bun. Looks like the subway bread. Mayo (2/3 cups) for spread on bread and (1/2 cup) for coleslaw. 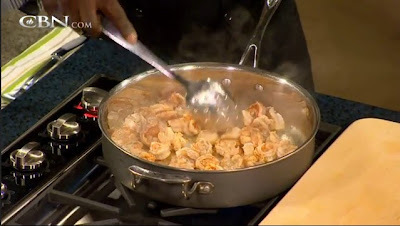 Before you jump into this dish, watch as David and Tamela Mann prepare the dish on the 700 Club TV Show. Shrimp: Mix Shrimp with 2 teaspoons of Cajun Season (season to taste). Heat up medium size skillet with just enough Extra Virgin Olive Oil to cook Shrimp in. Cook shrimp until the color changes. Here's how your shrimp will start to look as you begin to cook them. Prepare the Bread: Mix together Dijon Mustard, Mayo, Cajun Seasoning (2 teaspoons or to your liking) and spread this on the inside of the Subway Bread. 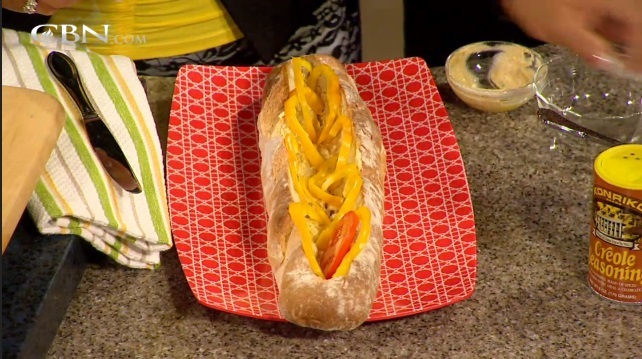 Place the yellow onion, tomato, and lettuce inside the subway bread. Here's how your Bread looks and how it will be dressed. 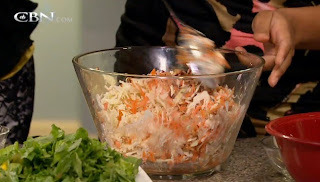 Apple Coleslaw: Mix coleslaw with the apples, apple vinegar, poppy seeds, carrots, mayo, onions, sunflower seeds, and kernels. This is how your Apple Coleslaw should start to look once you mix everything. 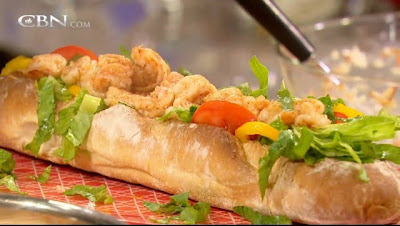 Once the shrimp have turned color go ahead and place them inside the subway bun and this will complete your Po-Boy. Tamela says the reason the why Hanging With The Manns has not aired yet, is because they have been searching for a network. I have been anxiously waiting for the show to premier, ever since I heard about it early 2013. 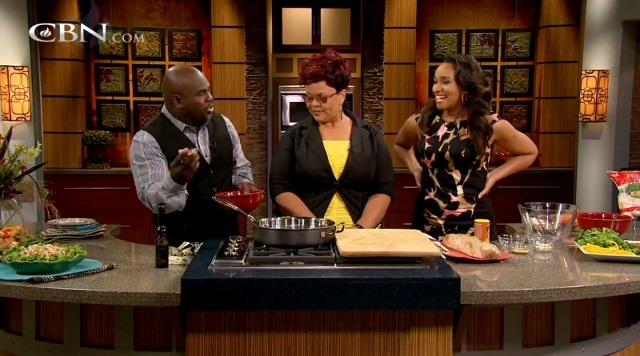 In one interview with Tamela Mann the interviewer asked her "Can you really cook?" And Tamela was like yes girl, can't you tell, look at me...lol! Well, just because she is a big girl doesn't mean she can cook, but her show says other wise. From what I have learn their cooking show is suppose to center around them taking trips to different parts of the world and based on where they are going they will get inspiration to cook a dish. I was doing some research on the show and to found out if they have selected a network yet and the only information I have found is something about Bob Cat Films. It looks like this company is the same company that films Ricky Smiley new show on TV One, but this is all speculation of course.